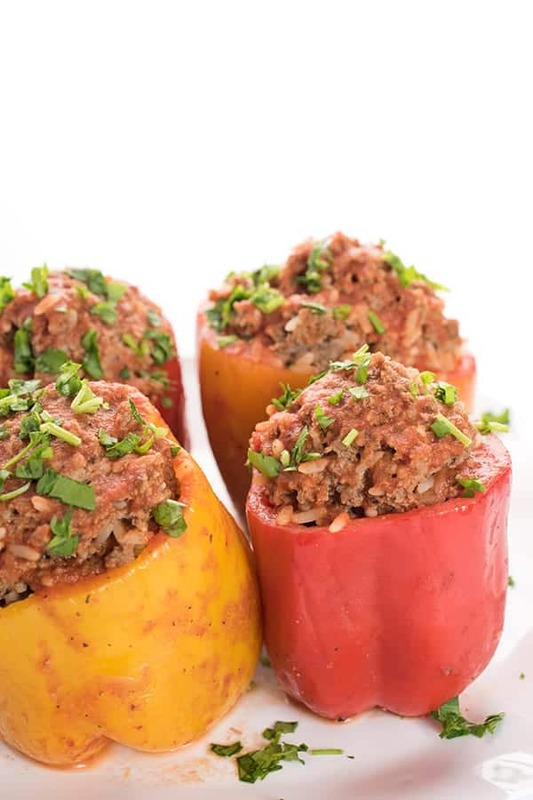 A Middle Eastern twist on the American comfort food classic, your family will love these hearty stuffed peppers filled with a cinnamon-spiced beef, rice and pine nut mixture. With Halloween quickly approaching, I wanted to share a nutritious and satisfying dinner recipe for your little goblins to enjoy before heading out trick or treating. 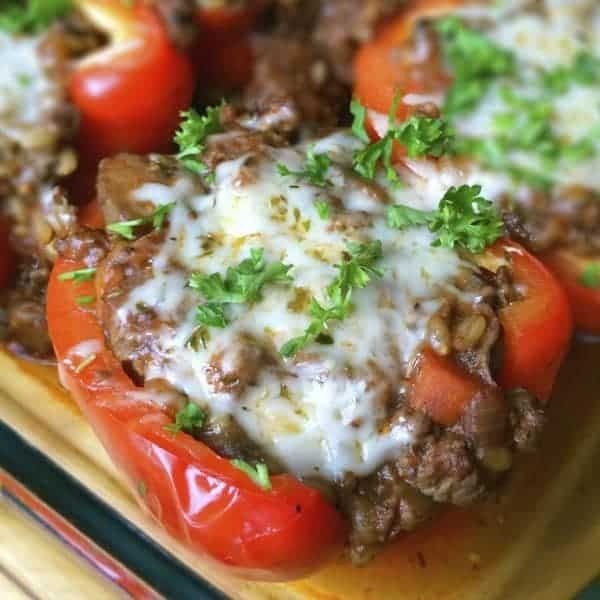 These stuffed peppers are a meal in one filled with beef, brown rice and plenty of veggie goodness. To save time during the dinner rush, prep these ahead and bake-off when you’re reading to enjoy. I like to serve these peppers with a dollop of plain yogurt or a scoop of Cucumber Laban which happens to be my toddler’s favorite food of all kind. The yogurt in this garlicky sauce helps cool down the dish which helps avoid burnt little tongues. After all, we don’t want to ruin any precious tastebuds that will soon be sorting, eating and hoarding candy. Cinnamon and toasted pine nuts give these stuffed peppers an interesting twist that I know will soon become a family favorite. We love using leftover brown rice but any rice or grain would work including bulgur wheat, quinoa, farro or white rice. Whatever you do, make it your own and enjoy the time with your family. Pre-heat oven to 350 degrees and have a 9 x 13 inch baking pan ready. Prepare the Lebanese Hushwee according to my instructions and stir in the cooked brown rice. Arrange pepper halves in a single layer in the baking dish and scoop the hushwee/rice mixture into each pepper half. Pour tomato sauce over all of the peppers and sprinkle with a pinch of salt and pepper if you're using salt-free tomato sauce. Cover pan with foil and bake for 45 minutes or until peppers are softened. 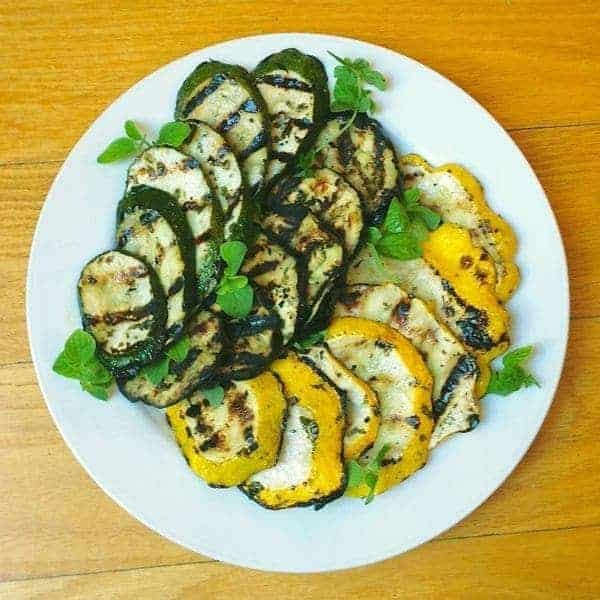 Serve with fresh parsley and plain yogurt. This is a very large serving - we were full after one half but I wanted to be generous. I’m so glad you enjoyed them Susan!!!!! I don’t think I’ve ever eaten a stuffed pepper let alone made one. (Jalapeños don’t count in this instance.) But, you’ve made me want to try! Yum! They are great for feeding a crowd, Jessica! I am so glad that you publish recipes that use posts I missed while I was traveling! These peppers sound absolutely delicious. 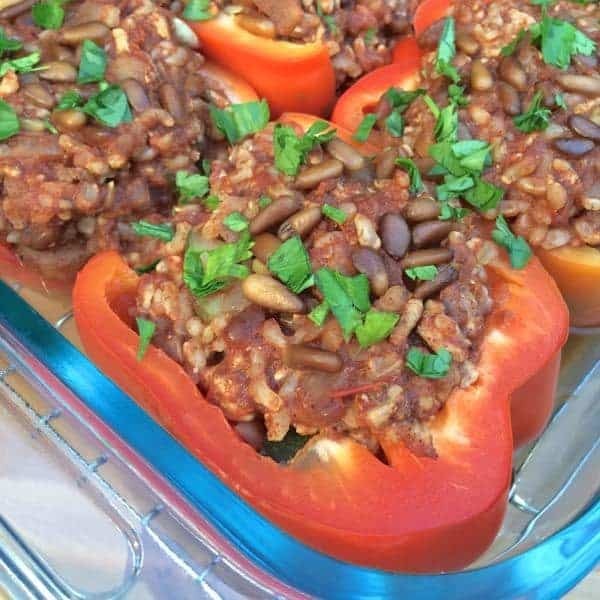 I recently tried a Mexican take on stuffed peppers, which was wonderful, but I definitely need to try this one, too. Strange that I’m not all that fond of the Hungarian version that I grew up on. I’m really looking forward to trying these. Oh I’m so glad you like that!!! I’ve never had the Hungarian version but these are definitely flavor packed. I hope you like them Susan! 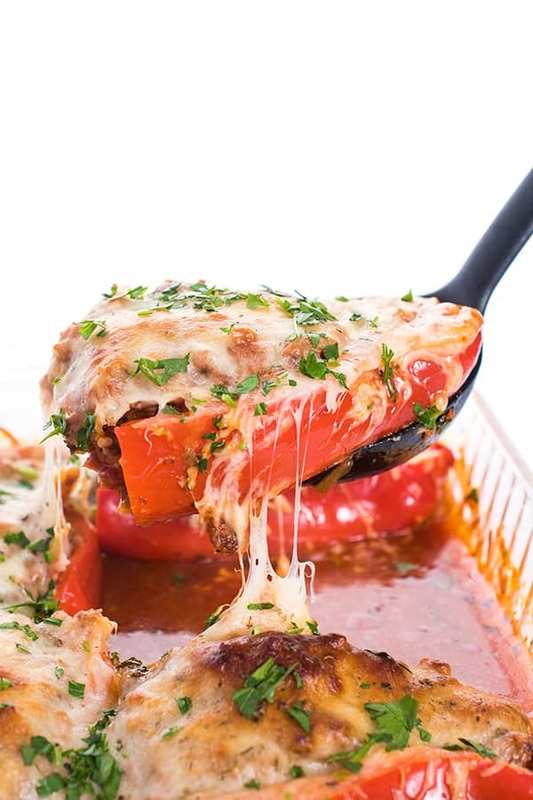 I’m not a big fan of stuffed peppers, but this filling looks amazing. Cinnamon, pine nuts, yogurt, yum… I’ve even got lots of cooked grains in the frig today – quinoa, freekah and brown rice. So I think I’ll use the filling and make a sort of sloppy joe kind of dinner. Is it dinner yet? That’s such a great idea!!! Oh my word! This looks so good, loving everything about it! 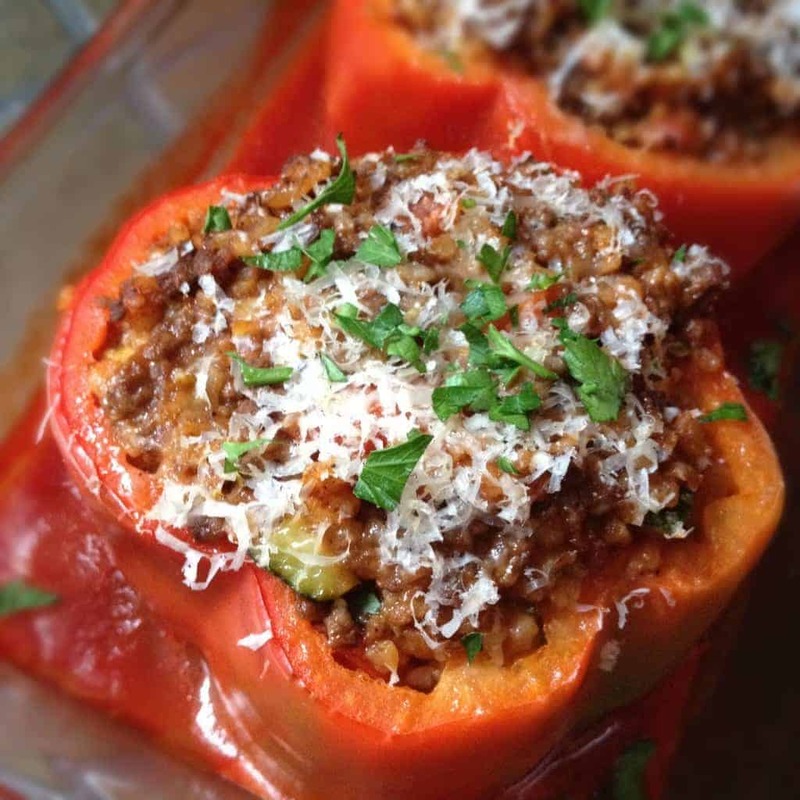 Stuffed peppers is one of my favorite dinners! I love your version…it’s so different! Is that cute little yogurt bowl from World Market? It’s so adorable! It’s actually from Meijer, a midwest grocery store chain! Thank you! The husband is a huge fan of stuffed peppers, and I’m a fan of anything that can be prepped ahead of time (clearly I’m the one who handles logistics around here :) ). It was great to meet you last weekend too! My husband adores stuffed peppers too. So funny. Great meeting you too! These look right up my alley! I will definitely be making soon! Thanks for sharing. I hope you love them Emily! Is it bad that even though I don’t have any kids I get all excited about color themed dishes around holidays? This one looks absolutely perfect for halloween! I love this new twist on it! And I bet that sauce takes it even farther! Yum! It’s so warm and comforting – let me know if you try it!